When I made the HUGE decision on December 4 to eliminate sugar and most carbs from my diet, I knew that it was a decision based on health, not necessarily one to lose weight. I'm 36... getting close to 37. At the time I was close to 315 lbs... My health was at risk. Week after week that has gone by, I feel like a healthier person. My heart burn is gone, my body hurts less, I have more energy... I just FEEL better. 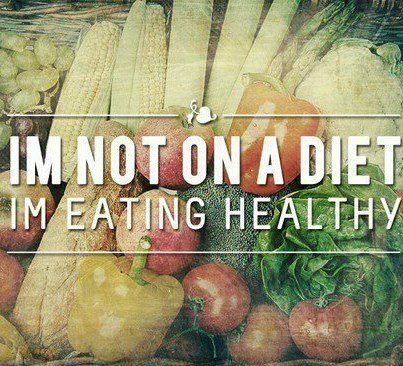 I believe that I'm healthier. My diet these days still consists of lean meat (chicken, turkey and fish mostly), fruit, veggies, eggs, cheese, and the occasional sweet potato fries. I'm drinking more smoothies in the mornings because they are quick and tasty (using designer whey or vi-shake protein powder). I occasionally eat a meal replacement bar (I found some great ones with only 10 carbs and lots of protein). But for the most part, I try to stick to WHOLE, UNPROCESSED FOOD. My body likes it. Not long after I started my no-sugar/low-carb days, I started tracking religiously. I try to stay around 100 carbs, and I found that my "comfortable eating days" usually fell around 1200+ calories. My Fitness Pal and LoseIt both had me at around 1690 calories for my age, weight, and activity level. But 1200+ felt like plenty, so I changed my budget to 1299 calories and pretty much stick with that. I try to get as much protein as I can and not go over 100 carbs (unless I have a lot of fruit). And eat real food... which I think makes me feel fuller and more satisfied. I never really worried about if I was getting enough calories, because I am full! The other day (by accident, really) I went over my calorie budget by about 200 calories. The next morning when I did my daily scale ritual, I expected a slight gain. But I had an almost 2 lb drop from the day before! So I went back through my food journal, and the days that I'm closer to my 1299 budget, I usually lose weight. But on the days that I only eat around 1000-1100 calories, I stay the same or show a slight gain... And the days where I exercise and have a huge deficit, same thing. Stay the same or a slight gain. Does this mean that I need to be eating more calories? Right now, my weight is fluctuating between 289-291... which is still a lot. I'm 5'8"... so pretty tall for a woman. Is my body actually trying to tell me to feed it more? Am I accidentally slowing down my metabolism? I'm still making the choice to be the best Hollie I can be. No excuses. I know I can be enough for me and my children. My world revolves around them, and now I have even more incentive to keep pushing forward with positive changes in my life. This is my year. Making myself better will make my kids have a better mom, my students have a better teacher, and my friends will have a better friend. The possibilities for my future are suddenly amazing. 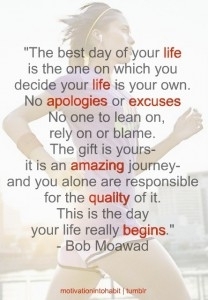 I'm so excited to live life now. I'm definitely changing from the inside out. I finally love ME! Hollie you could very well need to up your calorie intake. If you're not eating enough, your body can go into starvation mode. You are doing an amazing job - from one single mom to another. Hollie,so glad you are putting yourself first. No matter what happens, you are controlling the things you can control. Good for you. Hang in there. I know it's a lot of work. That's wonderful that you feel so great with your new diet. And yes, I think it's dangerous to go too far below your targeted calories. Your body needs a certain amount -- when it gets too few, we actually conserve body fat. So stay as close to your target as you can. :) Keep up the great work! Regular usage of Psyllium husk once in a month also helps weight loss by keeping your metabolism rate since it acts on the digestive organs. Also, it is very important that when you take psyllium husk, you drink extra water to ensure that the psyllium can move through the colon with ease. Psyllium fibers absorb waste in the stomach and removes it out from the colon. Psyllium should always be taken on an empty stomach – that is 1 hour to 30 minutes before breakfast and/or lunch and/or supper. Regular intake of Psyllium Husk promotes in losing extra pounds from stuck body toxins. Regular exercise and healthy diet while taking Psyllium Husk will greatly help to speed up losing unwanted body fats. Eat more! Your body is releasing weight the closer you are to your target calories because it doesn't feel like it's starving (and subsequently needing to hold on to as many calories as possible). Hey Hollie, my mum is going through divorce right now after 25 years of marriage and I am sure she is feeling much the same as what you are now. I WISH that she would take the time to look after herself and her health better as you are doing. Don't ever feel guilty for what you are doing, because in the long run everyone will benefit from it!! Best of luck! You talk a lot about health and feeling healthy but then you always bring up the scale and lack of movement. In a sense these two things can be contradictory. As a fellow health/weight loss striver I know how they can be intertwined but sometimes we have to decide what is more important. If it is health then the whole foods and exercise will eventually lead you to where you need to be, while eating the calories you should. Living like the person you want to be will eventually get you to that place, maybe not as quickly, but definitely in a healthier way. So my take is....YES you need to eat more. Its so great that you are staying so positive on making yourself healthier and happier when alot of people would decide to give up when dealing with stressful situations. More power to you and keep up the good work! Wow sounds like you are doing a great job at sticking to your goals and staying positive. Alot of people out there are not strong enough to keep going. Keep up the good work! Hollie! You are so dang Awesome. What a strong woman you are. Hang in there... 2013 is your years! No Excuses! I lose best if I have one high calorie day every week or so, it seems to "jolt" my system to a loss, usually within 3-4 days afterwards. Well, going on dieting is not the perfect solution but a proper healthy eating plan as well as some good exercise suggested by a fitness trainer or dietician would help definitely. I've only been trying to lose weight for a couple of months, but I've found the exact same thing happening. Weeks when I would eat around 1000 calories every day I would lose nothing. Then as soon as I started to eat round the 1250 calorie or more mark I would lose 2-3kgs (4-6 pounds) a week. Your blog is really awesome, that is why I just keep on coming back. It will be my pleasure if you visit mine @ http://www.zuup.com/what-is-zuup You see I’m a health care enthusiast, looking forward to hearing from you. 25 down, and winner #3! Last call for Jarrett Jordan! How We Did It... Book Giveaway #2! Just Tell Me What To Eat... Winner!